Thousands of years ago the Founders combined their powers to create an equitable society governed by contagions inserted into their blood. After nearly a hundred Rulers, one man split the singular power of reign between his three sons, severing the Legion. Now, the brothers clash over turf, the Function drug trade, and their family’s fate. The Curse of the Generations holds strong. One dagger and one soul will determine their liberation or annihilation. Can the daughters of the Claimed rise to tame the men bound by retribution? Under-the-table motorcycle mechanic Sly Morgan has been running his whole life, from his parents’ past, and now, from the Legion drug dealers who murdered his family. When he’s found, Liberty, the Ruler’s daughter, plunges her father’s dagger in Sly’s heart. The antigen within grants Sly a name and a purpose but enslaves him to the Legion, a new hell hidden in modern day Chicago. His only salvation is Gracious, a Claimed woman driven by strength and compassion, bound to her own web of deceit and forced servitude. Protecting the secret locked inside him allows Sly a shot at a future, but spurs the rulers of the Legions toward war. His allegiance could unleash peace or seal their Second Deaths. 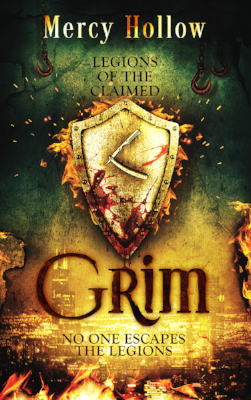 Sovereign Shield to the youngest of the three brothers, Grim fights to regain the humanity he lost to the Legions. Feisty waitress Sensual, recently Claimed and sentenced to the designation of Service, refuses to devalue her life and accept her new fate. Trapped in their ruler’s war against his brothers and the ticking clock of the Ceremony, Grim lowers his safeguards to gain Sensual’s trust. A vulnerability he can’t afford and a risk that could condemn her. The code of the Shields is their only salvation. A code the three brothers battle to destroy.